Standard eyeglass lenses correct the majority of an individual’s vision problem, but the concern is that they leave small distortions uncorrected. This results in complaints of halos, star bursts, or glare around lights. This cutting edge technology uses 3,425 points of data from a person’s eye to correct their vision to an unprecedented level of accuracy, which reduces or eliminates those complaints. The patient looks into the i.Profiler® instrument, also called an aberrometer, and their individual vision profile is generated within 30 seconds. This information is used to create custom lenses, called an i.Scription®, that fit into any eyeglass frame and costs an additional $40. 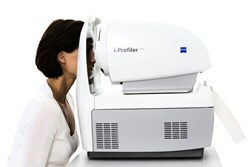 The i.Profiler® and i.Scription® technology is developed by Carl Zeiss Vision, the same company that designs camera lenses used for Google Earth and NASA imaging; and those used to film “The Lord of the Rings.” More information regarding this technology can be found at https://www.visionologyutah.com/technology. Michael S Peterson, OD, PC was established in 2005 and is owned and operated by optometrist Michael Peterson. The name became Visionology with the introduction into the Utah market. Visionology is dedicated to providing the residents of Draper and surrounding communities with the most advanced technology available for eye care and eye wear products. This technology allows people to enjoy the clearest vision possible and also benefit from the most comfortable examination process available, by removing the need for inconvenient dilation and the detested “air puff” test.